Summary: Rain moving in tonight. Won’t leave until it ends with strong to severe storms on Tuesday afternoon/evening. The temperature gets cold again. We’re watching for a chance of strong to severe storms possible Tuesday, but until then, we will see some rain. Today, we’re being treated to another gorgeous day. Our high today will reach about 66 degrees under mostly cloudy skies. It will be windy again with winds 10 to 20 mph, gusts up to 35 mph out of the south southwest. Tonight, showers start to roll in giving us a 60% chance of rain. Some thunderstorms could happen after midnight. The overnight low only falls to about 54 degrees. The HRRR shows a couple of lines of spotty showers that move in around 7-8pm. One or two of these may be strong enough to put down a lightning strike or two. Nothing severe is expected. Below is the HRRR simulated radar from 10am Sunday through midnight Monday. These hit and miss showers are expected to continue through the overnight hours and into early Monday morning. For Monday, we start the day off with a 50% chance of showers (lingering showers from overnight) up until about noon, with our high temperature reaching about 60 degrees. 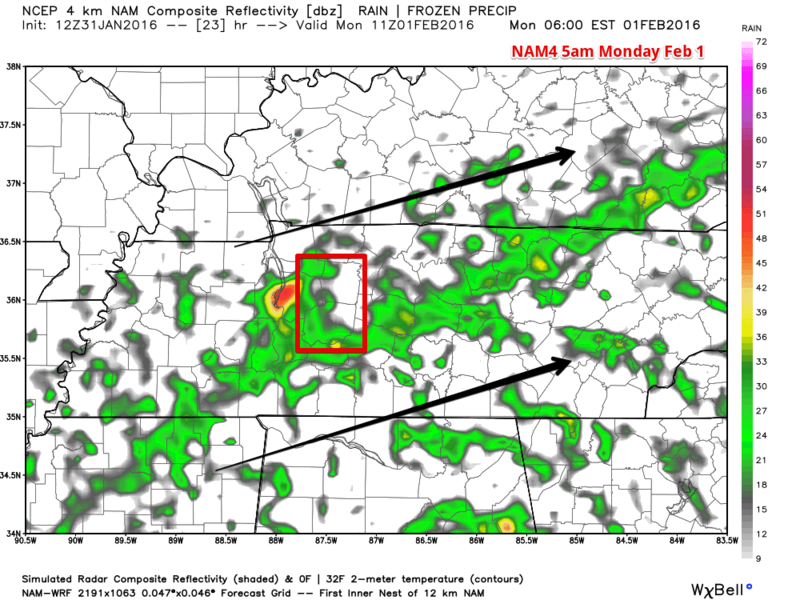 NAM4 shows spotty showers in the early morning hours Monday. 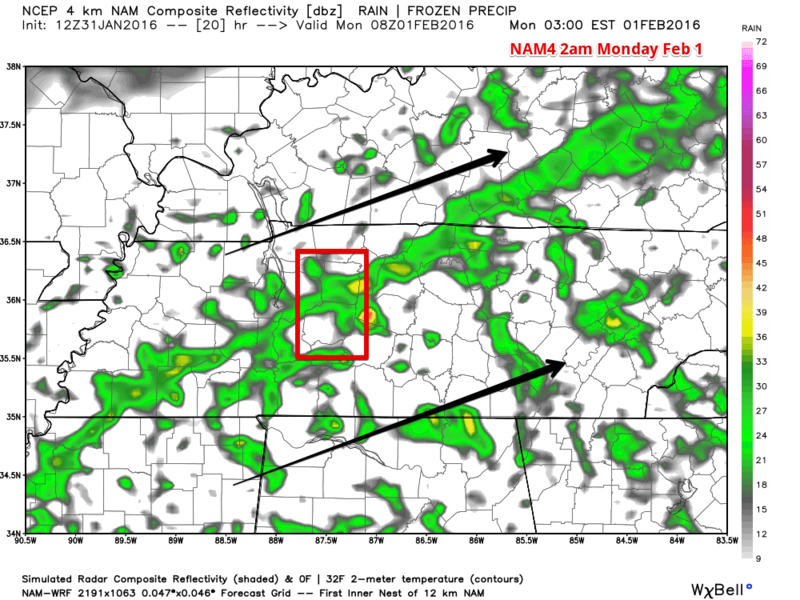 Here’s the NAM4 simulated radar for 2am Monday morning. Spotty showers continue into dawn on Monday. Here’s NAM4’s simulated radar for 5am. Spotty rain chances stick with us through the morning commute and morning hours. 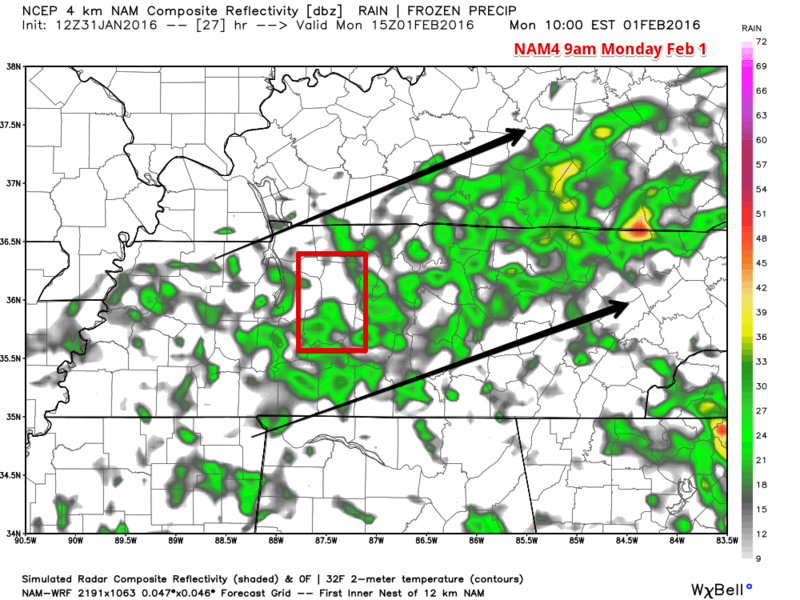 NAM4 simulated radar for 9am. The showers start moving out around lunch time for us. 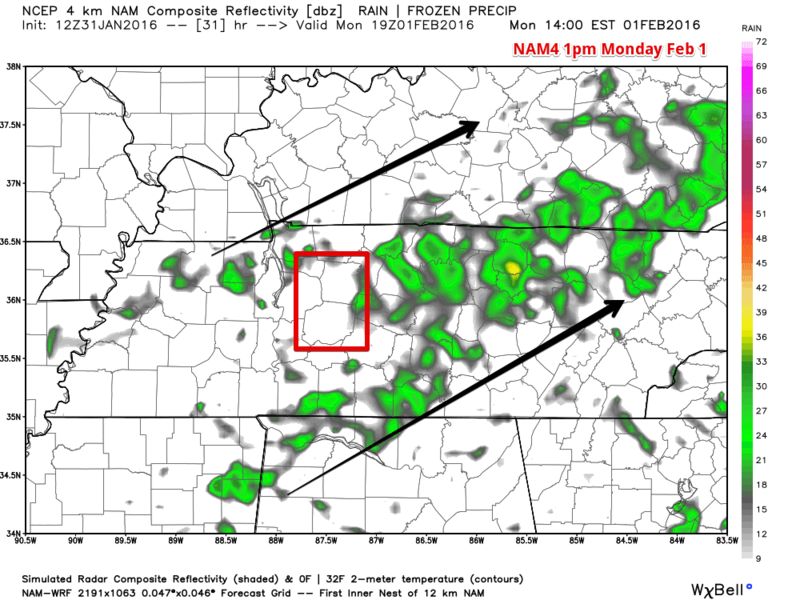 Here’s the NAM4 simulated radar for 1pm Monday afternoon. The afternoon and evening hours appears to be dry with mostly cloudy skies. Winds will also be much calmer on Monday as well. Overnight, some spotty showers start to creep back in, mainly after midnight. The overnight low will fall to about 51 degrees. Tuesday is when things start to get rough. Our rain chances increase to 60% with our high temperature expected to reach 68 degrees. Winds will increase too, helping bring in a chance for severe weather, 5 to 15 mph with gusts up to 25 mph. NAM4 is showing us getting the same spotty showers we seen Monday starting at about midnight Tuesday and going all the way through until we see some possible severe weather Tuesday afternoon through to the evening hours. We’ve been watching for 7 days now a chance for severe weather for Tuesday. It’s rare for the Storm Prediction Center to outlook our area (or any area) for severe weather so far in advance. It’s even rarer that they put an area in 30% chance of severe weather in the 4-8 Day Outlook. For their Day 3 Outlook released today, they’ve put us in the ENHANCED category for severe weather between Tuesday 6am through Wednesday 6am. This is a 3 on a scale from 0 to 5. Here’s what our local NWS office is saying about Tuesday, with their Hazardous Weather Outlook. A POTENT COLD FRONT MOVING ACROSS THE REGION WILL BRING SCATTERED STRONG TO SEVERE THUNDERSTORMS TO THE MID-STATE LATE TUESDAY AFTERNOON AND NIGHT. THE BIGGEST THREAT WILL BE LOCATIONS AROUND AND WEST OF THE I-65 CORRIDOR. DAMAGING WINDS AND ISOLATED TORNADOES APPEAR POSSIBLE AT THIS TIME. SPOTTER ACTIVATION WILL BE LIKELY NEEDED ON TUESDAY. 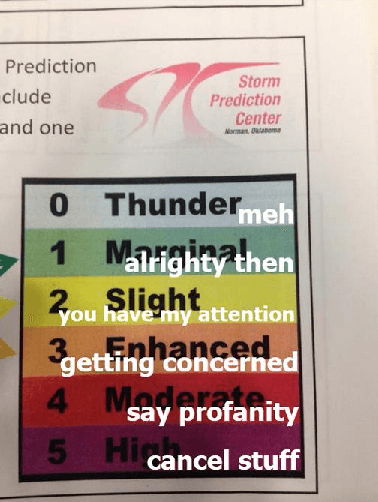 While the event is still three days out, what we think right now is that the cold front will bring in a squall line (QLCS for the weather nerds) that will bring with it mainly damaging straight line winds and a few possible tornadoes embedded in that line. 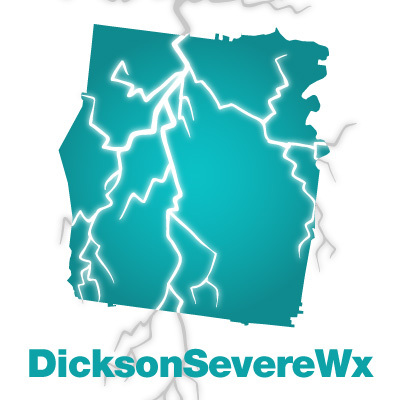 For us here in Dickson County, we fall in the area NWS feels most likely will see some of the worst part of the squall line (areas along and west of I-65). The medium-range models are just now getting into range for Tuesday’s event. 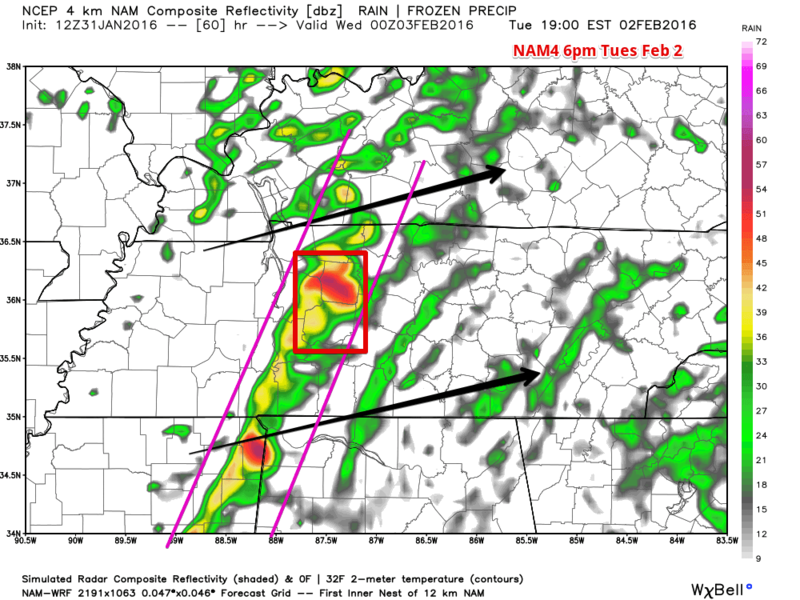 Here’s the only real glimpse of what the radar could look like on Tuesday from NAM4. This is at 6pm Tuesday evening. Disclaimer: This is only one model run of one model, so we can’t say the squall line will get to us at 4-5pm Tuesday. In other words, don’t take this timing as gospel. Things can and will change and the storm can come in quicker than anticipated or slower than anticipated. This will be a high wind shear, low instability event. What this means is that the cold front is bringing in a lot of wind energy, but the amount of fuel (CAPE or instability) for thunderstorms and tornadoes to feed off of will be low. CAPE values will be around 600-800 J/kg according to the NAM4 model at 6pm Tuesday. There’s been some talk about comparing this event to the January 30, 2013 squall line and the Super Tuesday 2008 tornados. It’s too early to compare this event with either of those two at this time. 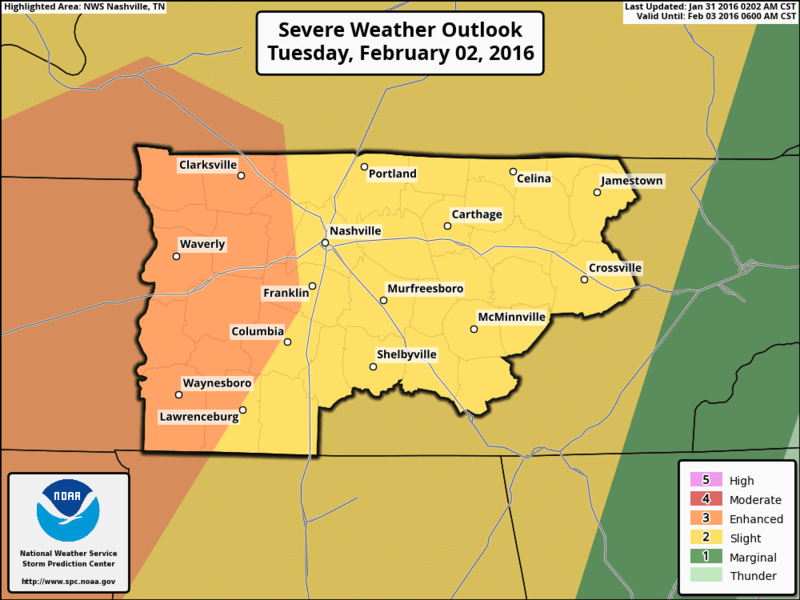 NWSNashville has a weather briefing Monday morning in which we will get some more info about Tuesday’s severe weather possibility. We will also publish a site update early Monday morning (before the briefing) and will make updates to the post as needed. Be sure to sign up for our site updates below so you can get these posts directly to your inbox the moment we publish it. 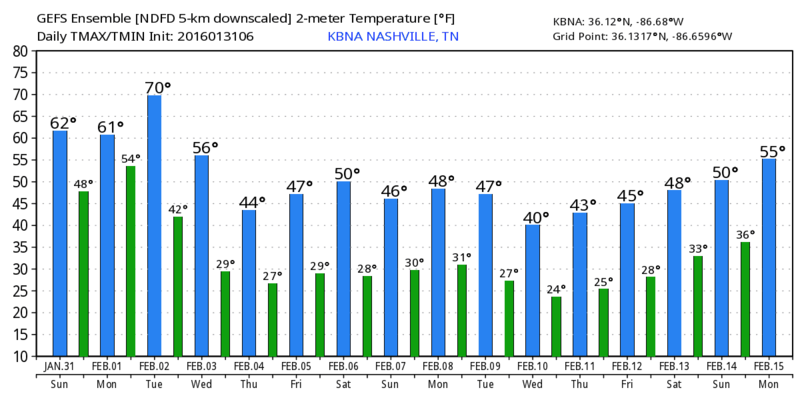 The rest of the week looks calmer starting Wednesday, with our high temperature reaching about 51 degrees. Wednesday night our overnight low will be a cool 29 degrees behind that cold front from Tuesday.